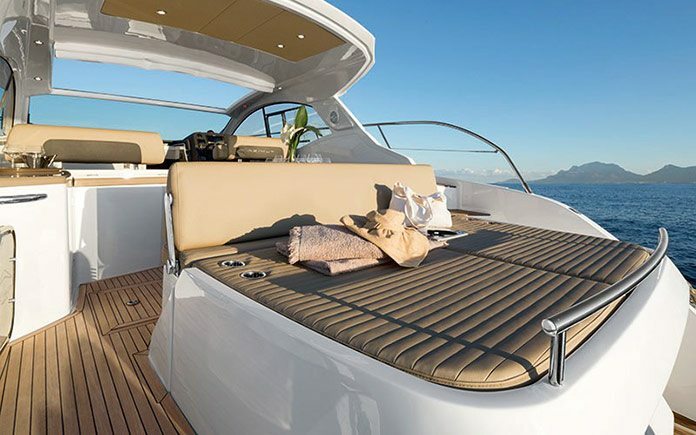 You couldn’t ask for more: the new Azimut Atlantis 43 is destined to be the new standard setter for its class. Bold and sporty on the outside, cool and refined on the inside, the latest Atlantis Collection offering is unadulterated Italian design and content. 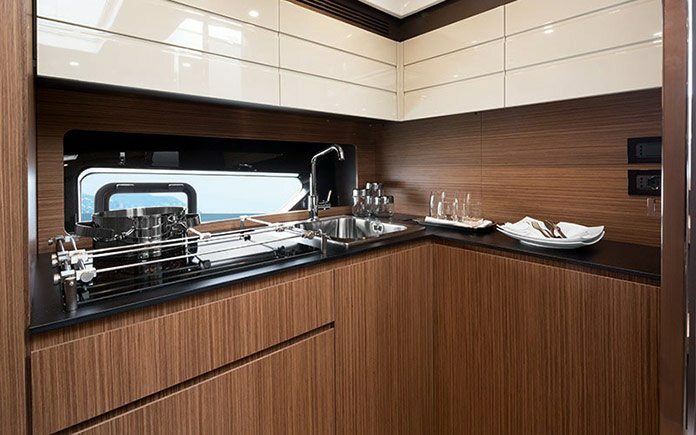 Made in Italy excellence aboard the Azimut Atlantis 43 with the freedom to select prestigious Italian designer fabrics, by Missoni and Loro Piana Interiors. 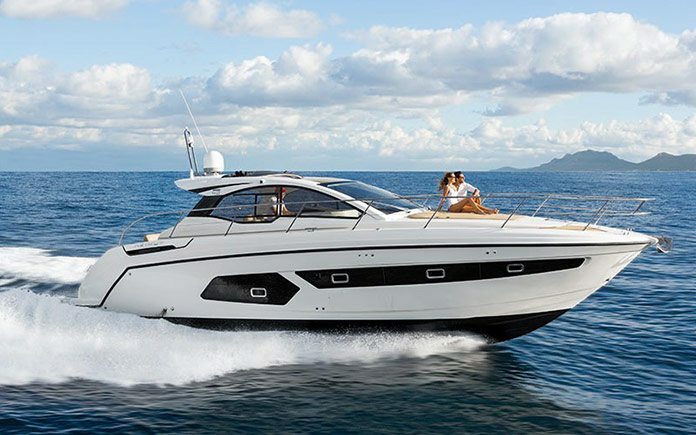 Azimut Atlantis 43 made its world premier at the Dusseldorf Boatshow 17‐25 January 2015 and exemplifies the Italian boatyard’s ability for continuous innovation while retaining their trademark style. 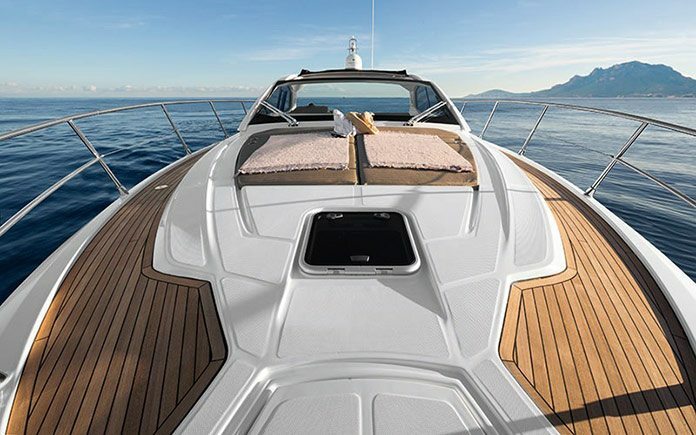 Azimut’s extensive experience produces a truly appealing open version, with smart and functional solutions to meet every need. The deck is this boat’s real centerpiece. 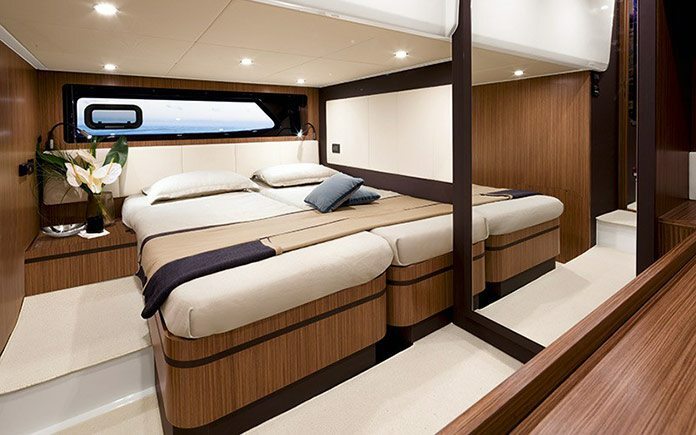 Transformable and functional, it features two large three‐person sun-pads, one to the stern and one to the bow. The large hard top offers sun and wind protection, providing a welcoming and comfortable shelter. 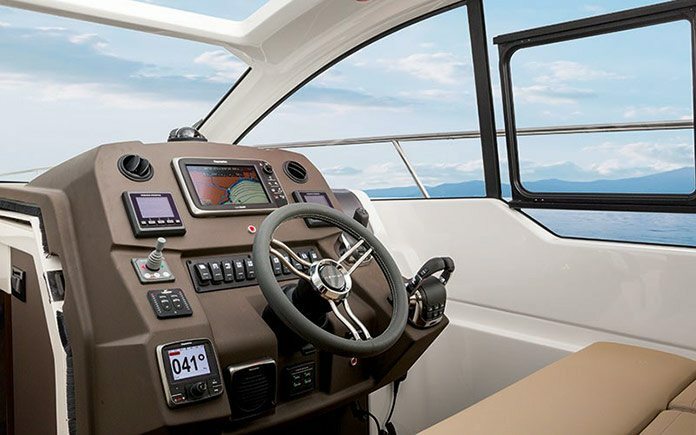 With a one piece windshield and lateral picture windows, the Atlantis 43 offers its guests unprecedented amounts of natural light that can also be modulated thanks to the large, electrically operated soft top. The exterior living area is equipped with a large dining room table, C‐shaped sofa, and kitchen area. The relaxation area next to the pilot station quickly transforms into forward facing seating, providing a comfortable vantage point from which to enjoy every moment of the cruise. The stern area with 3.5 sq.m. of decking is a masterpiece of engineering. 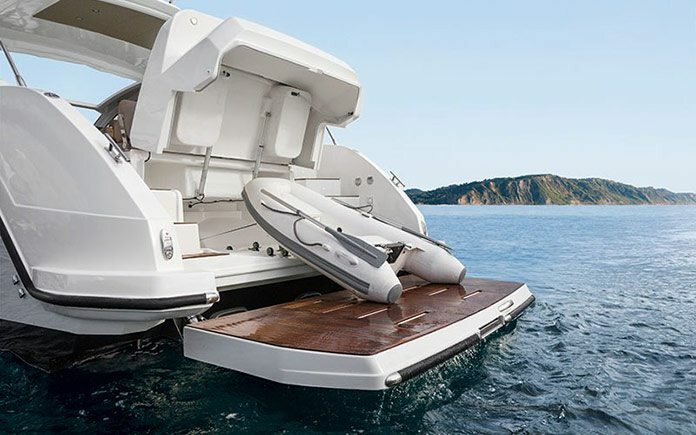 Accessible via two sets of steps on each side, this amazing terrace on the water can be used to haul in and launch the tender or other water toys perfectly housed in the garage under the stern sun-pad. The same engineering standards of above deck can also be found below deck. 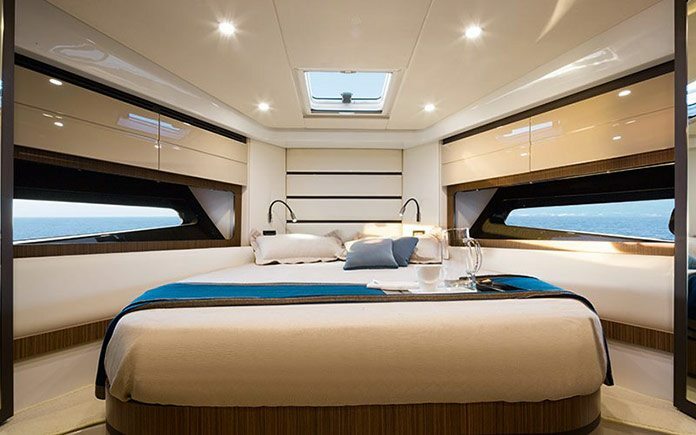 To the bow, there is a full‐height boat-owner suite with incredible natural light thanks to the hatch and extensive picture windows along the sides. 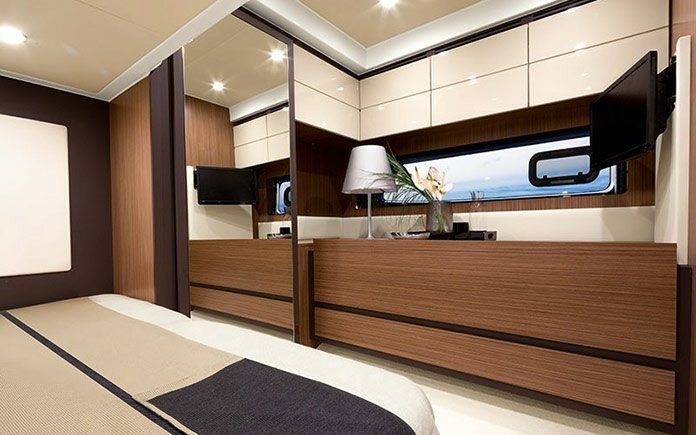 Equipped with an exclusive bathroom complete with separate shower stall, in this cabin as in the rest of the below deck areas in the Atlantis 43, there is also plenty of stowage space for luggage and equipment. 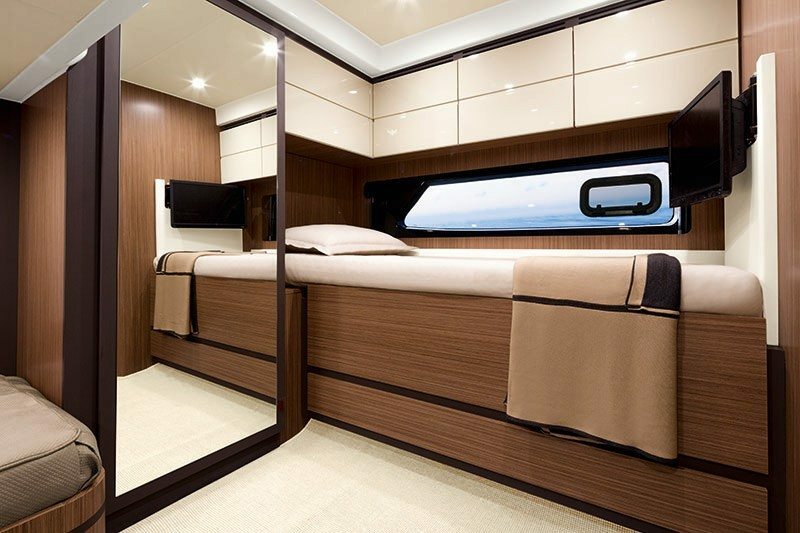 There are two closets and two sets of wall cabinets, as well as a large compartment accessed by tilting the bed. The heart of the interiors is the living area. 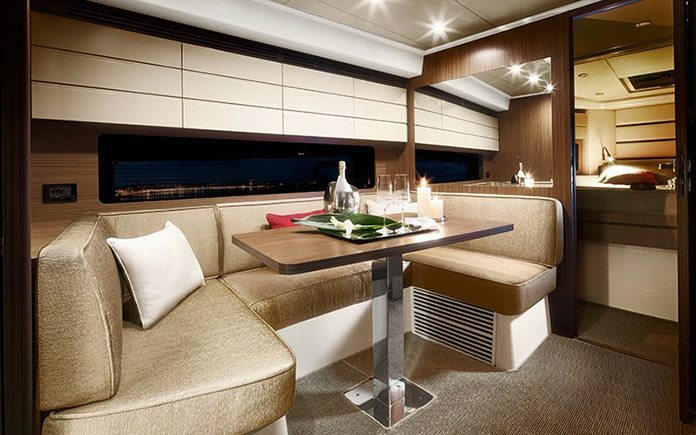 Located amidships, it is comfortable and welcoming with a kitchen zone (sizeable and well equipped), and a dinette with a height‐adjustable table that also converts into a bed. 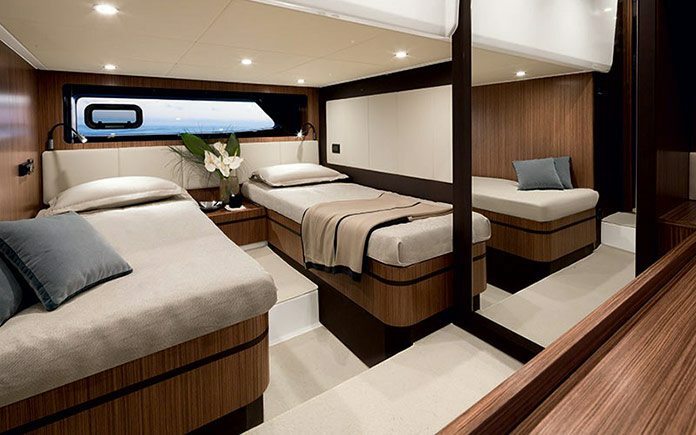 From here you can reach a second on-board bathroom which also includes a separate shower stall. This can either serve the guest cabin or function as a daytime bathroom. 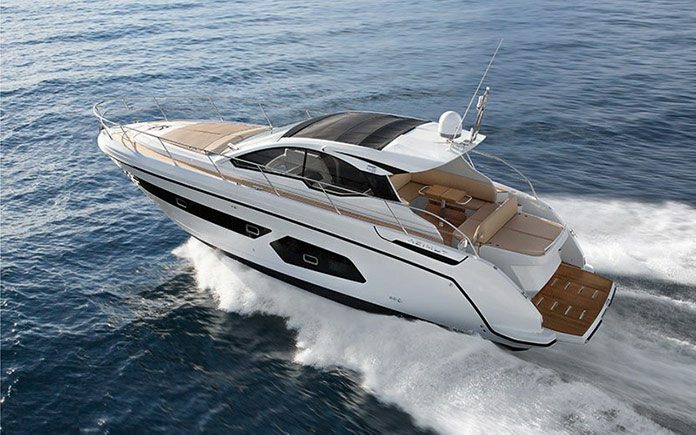 The new Azimut Atlantis 43 is powered by two V400 HP Z‐drive Volvo Penta D6 engines for a maximum speed of approximately 33 knots.